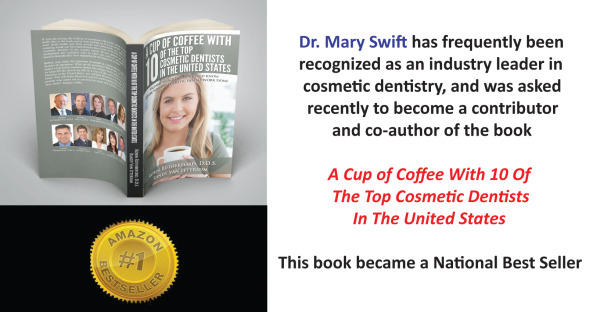 Teeth Whitening | Dallas, TX | Mary Swift, D.D.S. Because having whiter teeth has now become the number one aesthetic concern of most patients, there are a number of ways to whiten teeth. The most effective and preferred teeth whitening method is an in-office procedure called Laser Teeth Whitening. Though more expensive, it takes about an hour and the gums are protected from being burned by a bleaching agent. The least expensive professional bleaching method is using a home teeth whitening system that will still whiten teeth dramatically. Since teeth whitening only works on natural tooth enamel, it is important to evaluate replacement of any old fillings, crowns, etc. Replacement of any restorations will be done after bleaching so they will match the newly bleached teeth. Teeth whitening is not permanent, although after laser whitening treatment your teeth will always be whiter than if you hadn't had it done. A touch-up may be needed every several years, and more often if you smoke, drink coffee, tea, colas, or wine. Stained teeth due to food and drink consumed over the years. This type of teeth whitening usually requires one visit, though Dr. Swift will suggest a second session if she believes a better result can be achieved. The first requirement is to have your teeth cleaned prior to the procedure, either at your regular dentist or our office. This will create much better results. At the appointment, we first paint your gums with a special barrier that protects them from coming into contact with the bleaching solution. We then add a bleaching paste to the teeth. The laser is then used to activate the bleaching agent (which is much more potent than you can buy in retail bleaching kits) going one tooth at a time. When all teeth have been lasered, we rinse off the bleach, then repeat the whole process. We also fabricate bleaching trays to be used for touch-up identical to those created for take home bleaching kits. You will receive care instructions for your teeth and trays, and be encouraged to visit us regularly for professional cleanings to help maintain a beautiful, healthy, white smile and protect your investment in laser teeth whitening. This type of teeth whitening usually requires a single visit as well. At the appointment, we first take impressions (molds) of your teeth to fabricate custom, clear, plastic trays. You'll try on the trays for proper fit, and adjustments will be made if necessary. The trays are worn with special whitening solution either twice a day for 30 minutes or overnight for a couple of weeks depending on the degree of staining and desired level of whitening. It is normal to experience tooth sensitivity during the time you are whitening your teeth at home, but it should subside shortly after you have stopped bleaching. Check out our Smile Analysis to see if laser whitening alone will give you the results you desire.